Thank you for visiting my products page. 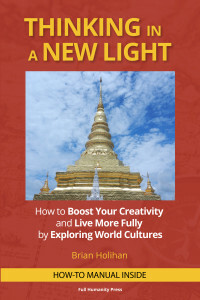 I’ve finally publish the first book, Thinking in a New Light. It’s much better than my blog–blog articles are short and granular, but the book builds to a conclusion that’s an unprecedented gala of perspectives. Here’s the beginning. You can get the entire book at Amazon. I fell in love with exploring different cultures when I was seven. My father subscribed to National Geographic and bought the Time-Life series of books on the world’s countries, and I experienced one Wow! after another. Egyptian pyramids, Angkor Wat, ancient Greek temples, the Taj Mahal, Chinese pagodas, Gothic cathedrals, and narrow boats gliding through Bangkok’s canals—what inspired so many different art forms? My parents often took me to San Francisco’s airport to watch the never-ending streams of people and planes. I found the women in sparkling red saris boarding an Air India flight especially intriguing. The vibrant hues and swirling forms seemed a world away from the jeans and short-sleeved shirts in my neighborhood. Since those days, I’ve always enjoyed airports as hubs where folks from all over the world, with their different mindsets, come together. So in 2007 I jumped at a chance to leave Silicon Valley’s high-tech workforce and travel around the world. I journeyed in Southeast Asia, Africa, and the Middle East, and since many of their cultures are not as well-known as the West and China are, I found that humanity is much richer than a small number of traditions. Traveling through one under-appreciated society after another made me think: This must be what heaven is like. One perspective after another opened up to me, and I was free to compare them in any combination I chose. All cultures seemed to shine on each other in a field of connections that became increasingly luminous and pervaded with love as the trip progressed. I realized that the world has so much cultural wealth that we can bring earth and dreams of heaven together. At the same time, we can enhance our creativity by accessing an ever-widening range of ideas. This book explains how to do both. But the world is currently rough for many, largely because people make it that way for each other. Political corruption, corporate greed, ecological destruction, prejudice, and terrorism run rampant. But if societies see paradise on earth as a basic concept, we’re on our way to living in it. More people will treat each other kindly, respect the ecology, and study and expose all cultures’ beauty. Parents and schools will teach children to see and share the world’s positive aspects, and people will forge public policies to develop them further. However, academic and scientific conventions say that we cannot discuss paradise because it’s too vague. Knowledge can only be about facts, which people can verify in laboratories, quantify, and store as bits of information in databases. At the same time, many people in today’s hyper-competitive digital economy only have time to focus on making ends meet. A friend recently told me, “Most people today are in survival mode.” Our current economic trends and intellectual conventions imprison us in a self-reinforcing cycle: Because paradise seems too remote to be found in the world and discussed, people hold onto a world-view that keeps it distant. So this book flouts precepts that say that we are less than we can be. 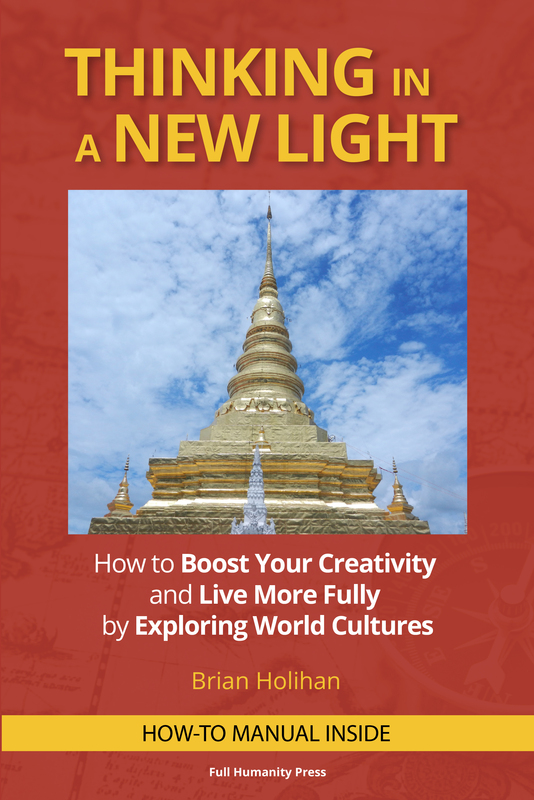 Since it’s about increasing your happiness and creativity by exploring multiple cultures, we will attempt the most inspiring vision that we can. We’ll soar as high as possible here by exploring places that I’ve journeyed through. Seeing several cultures back to back during my trip transcended perspectives bound to conventions, not by one step, but by gleefully skyrocketing beyond them. I’ll share this experience with you in the following pages. To give you my full experience, this book mixes cultural depths of the places I toured with my travel tales. My journey wasn’t a typical sightseeing jaunt because I had studied the histories and traditions of the societies I visited before leaving home. Seeing their pasts reflected in the present made my travels more rewarding than they would have been if I had only focused on current events. Because it added more depth to my experiences, we’ll delve into the roots of the cultures I explored and attain perspectives that can reveal their full richness. I also often carried a guitar and played it with people. I’ve found that music is one of the best ways to immerse myself in other cultures because it allows me to share people’s feelings more deeply. It was the combination of all these types of experiences (emotional and intellectual, traditional and contemporary, imaginative and earthy) that made me feel that this trip was like paradise. It was so full and wide-ranging that my journey transcended all categories so that everything around me seemed to glitter. I discovered a method for finding paradise in the world. It’s very simple—you can summarize it in six letters and put them on a T-shirt. It shows a way in which all people and cultures are connected that hasn’t been taught in schools, and how we can think about this connectedness in optimal ways for our well-being. I’ll detail it later, but not until the middle of the second part of this book because this method isn’t an immediate fix. You have to appreciate multiple cultures in order to make it work for you. But we’ll have enough material by the middle of Part Two to apply to it. By the time you finish this book, you’ll find that paradise is right here and that you can help expose it further so that it will be a daily experience for you and the people you’re close to. The manual at the end details how to do this. In Guns, Germs, and Steel, Jared Diamond asked why history happened as it did. Why did the West become the world’s most dominant culture between the 18th century and the end of the 20th? This book asks: How can history be more rewarding for everybody? What way of looking at the world can promote the most well-being for the most people and allow all cultures to appreciate each other’s most inspired creations to the greatest extent? We’ll see how all societies can highlight each other’s positive sides, and how their people can combine such a big range of perspectives that creative breakthroughs can become so easy that you can have them whenever you want. As you do, your view of the world will keep growing bigger and more inspiring. But I don’t gloss over any ugliness that I found on this trip. I wanted a full romance with the world. Other than the worst human behavior, I wanted to see and feel as much as possible, and this meant feeling some pain at times. I saw many scars from the Khmer Rouge’s regime in Cambodia, and it was gut-wrenching to witness hoards of begging children with hopeless eyes. All the countries I traveled in have immense gaps between the rich and poor, and more political corruption than any city dump can hold. However, I found that the cultural wealth in all these countries was thousands of times worth the heartaches. As I ventured to study humanity’s better side, it seemed as though the world was opening more of its splendors to me. My trip usually felt like a dance with the entire globe that was sheer electricity. This book is my gift back. Looking forward to publication day.